RSD 2019 release. Wewantsounds is delighted to announce the first-ever official vinyl reissue of Ziad Rahbani's mythical Lebanese Disco 12" Abu Ali, originally issued in Lebanon in 1978 on his label Zida Records. A highly collectible album, it will get reissued by Wewantsounds with its original artwork, remastered by Colorsound Studio in Paris. Ziad Rahbani is a cultural icon in Lebanon. The musician, pianist, and producer is also a renowned playwright and a political activist, one of the most important exponent of the Lebanese left-wing counterculture to emerge from the '70s. Coming out of an illustrious artistic dynasty (his father is the famous composer and musician Assi Rahbani, member of group The Rahbani Brothers and his mother is the legendary Middle East Diva, Fairuz), Ziad Rahbani started his music career during his late teens, composing music for his mother. Rahbani quickly spread his wings further. He started producing his own music co-founding the label Zida in 1978 at age 22 in the process and started releasing records under his own name. 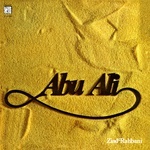 Among these was Abu Ali recorded in Greece at the EMI Studios in Athens with a full orchestra -- there he also recorded his mother's album Wahdon (1979) -- and released it as a limited run EP for the Lebanese market. Legend has it that the album was only pressed at 500 unit hence its rarity. The result is a fabulous New York-meets-Beirut disco ecstasy, developing over two 13-minute tracks and one of the most collectible albums on the international dance and disco scene.